Looking for a special gift for that special police officer, fire fighter, military spouse or anyone special in your life? Our handcrafted & engraved wood key chain is a prayer they get to take with them each time they leave the house. 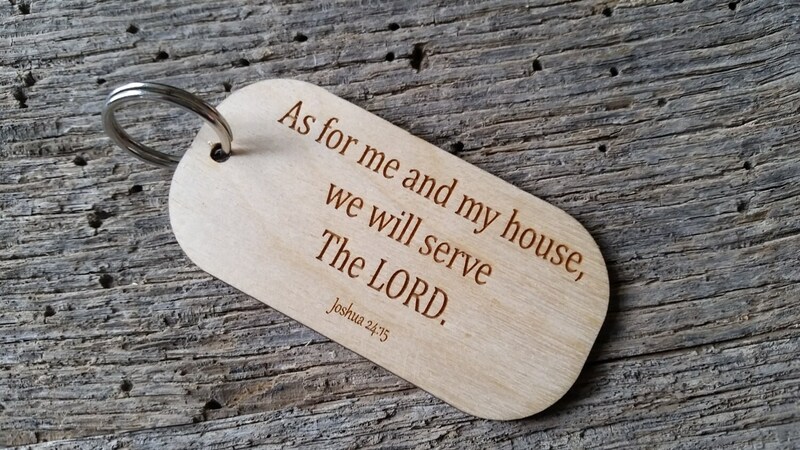 Joshua 24:15 is nicely engraved on the key chain. This plaque will make a great gift for other occasions like their birthday, Mother's Day, Father's Day, Christmas or just to tell them you're thinking of them. This key chain can be engraved with his or her name and rank on the back. Size: 3.5 inch long x 1.5 inch wide. Want something else engraved? We love custom orders just contact us!